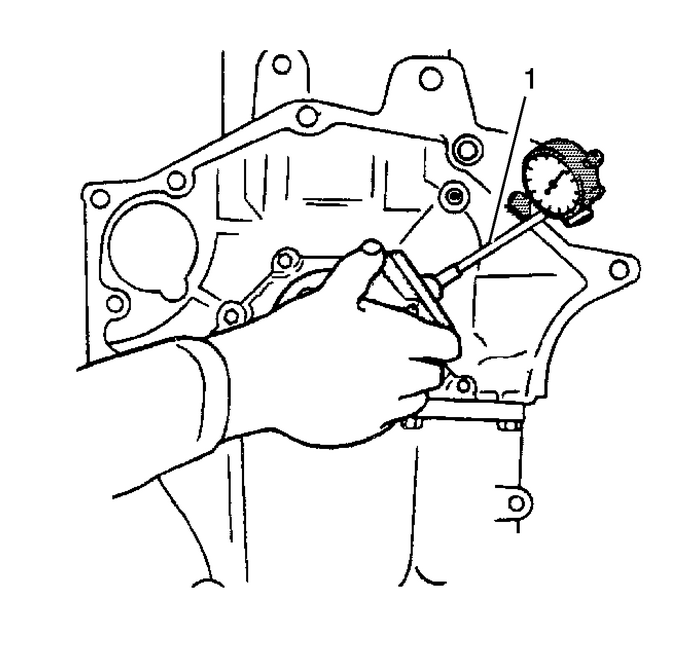 Clean the sealing material from the gasket matingsurfaces-(2) with a suitable tool-(1).Clean the engine block and lower crankcase in a cleaning tankwith solvent appropriate for aluminum.Flush the engine block with clean water or steam.Clean the oil passages.Clean the blind holes.Inspect the cylinder bores for glazing. If the bore is glazedbut otherwise serviceable, refer to Deglazing Procedure inCylinder Boring and Honing.Spray the cylinder bores and the machined surfaces withengine oil.Inspect the threaded holes. Clean the threaded holes with arifle brush. If necessary, drill out the holes and install threadinserts. Refer toThread Repair. Note:Do not attempt to machine the lower crankcase to engine blocksurfaces. 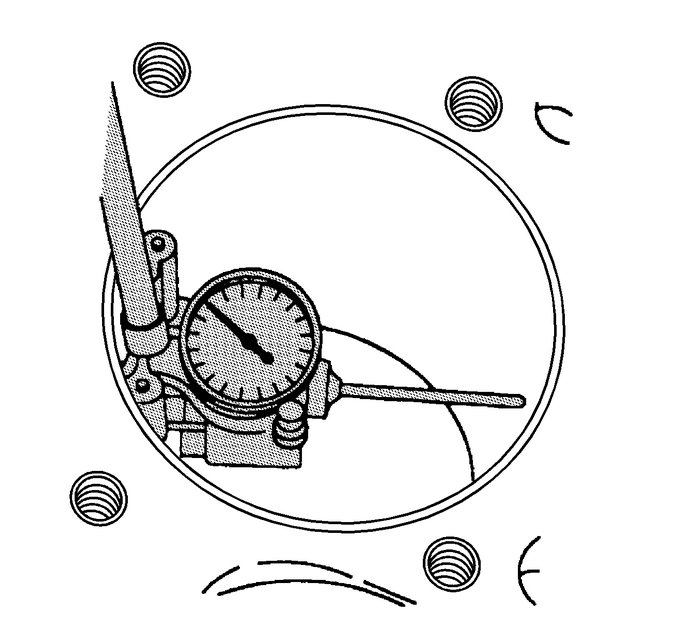 Use a straight edge-(1) and a feelergauge-(2) to check the deck surface for flatness.Carefully machine minor irregularities. 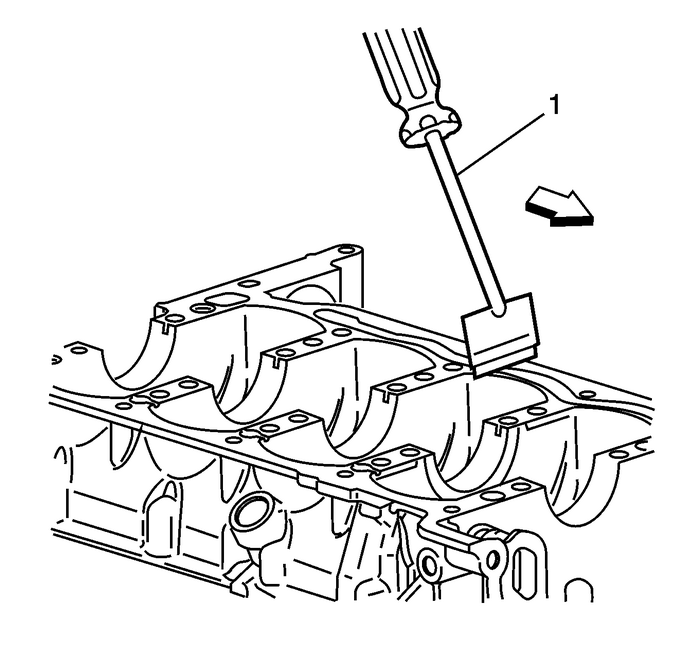 Replace the block if morethan 0.254-mm (0.010-in) must beremoved.Inspect the oil pan rail for nicks. Inspect the front coverattaching area for nicks. Use a flat mill file to remove anynicks. 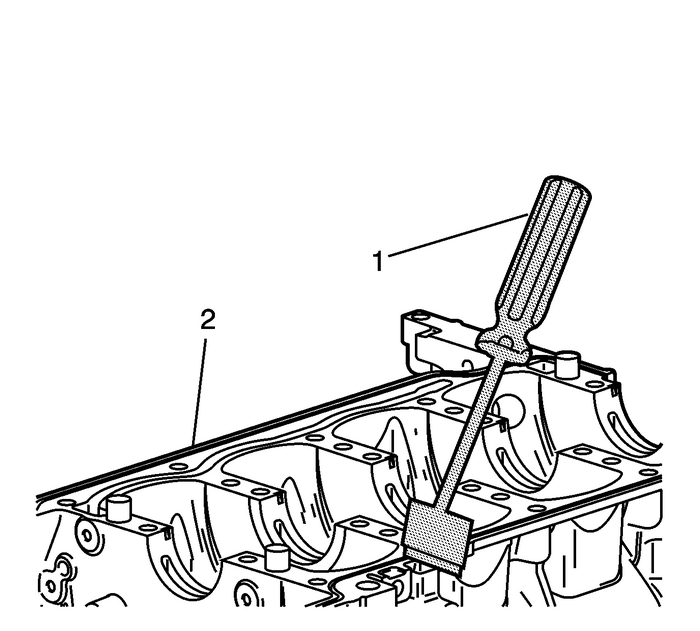 Clean the sealing material from the gasket mating surfaces onthe lower crankcase engine block side with a suitabletool-(1). 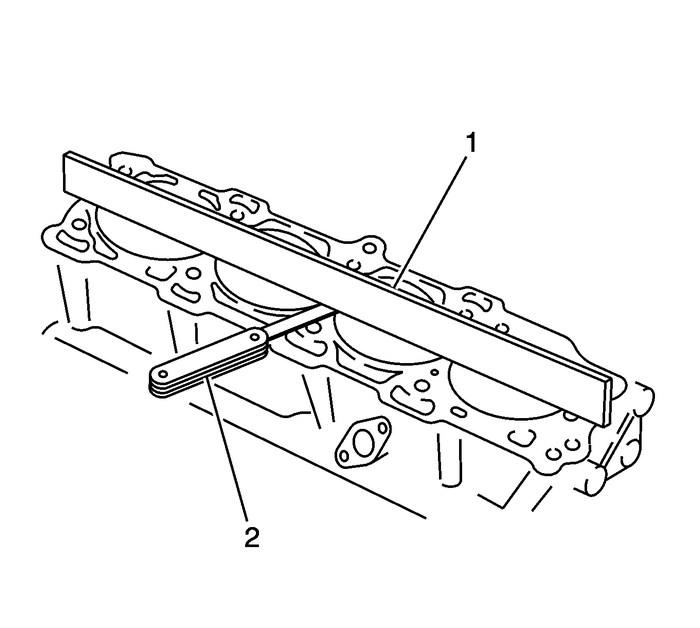 Clean the sealing material from the gasket mating surfaces onthe lower crankcase oil pan side with a suitabletool-(1). Inspect the mating surfaces of the transmission face. 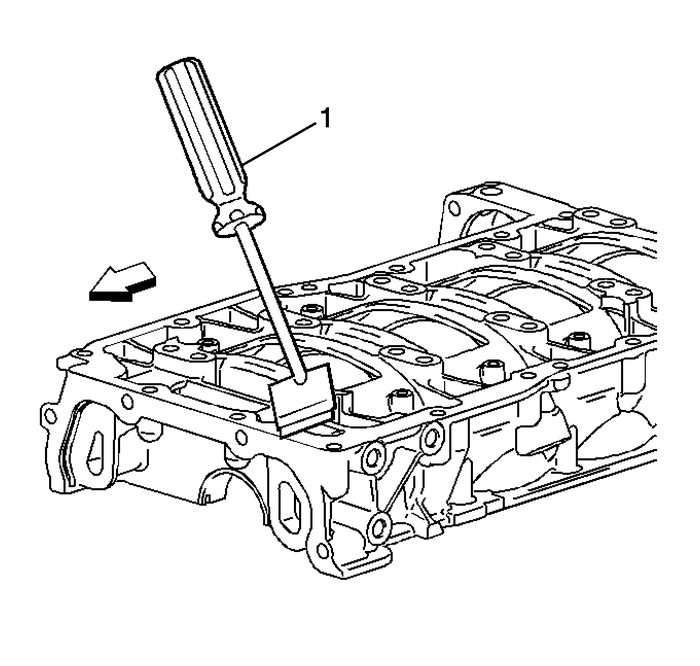 Caution:A broken flywheel may result if the transmission case matingsurface is not flat. 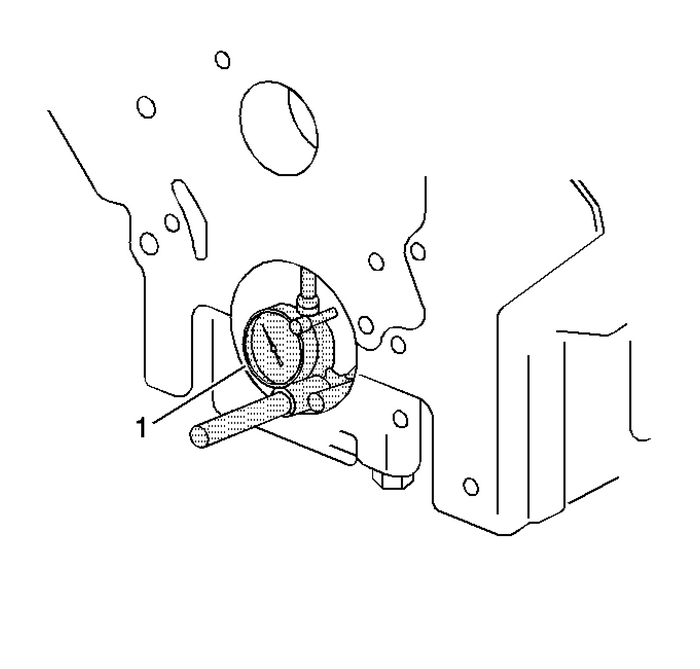 Use the following procedure in order to measure the engineblock flange runout at the mounting bolt hole bosses:Temporarily install the crankshaft and upper bearings.Measure the crankshaft flange runout using theGE-7872dial indicator-(1)Hold the gauge plate flat against the crankshaftflange.Place the dial indicator stem on the transmission mountingbolt hole boss. Set the indicator to 0.Record the readings obtained from all of the bolt holebosses. The measurements should not vary more than0.203-mm (0.008-in).Recheck the crankshaft flange runout if the readings varymore than 0.203-mm (0.008-in).Remove the crankshaft and bearings. Measure both the thrust and non-thrust cylinderdiameter at 13-mm (0.510-in) below the decksurface-(1). Record your measurements.Calculate the difference between the2-measurements. The result will indicateout-of-round at the upper end of thecylinder.Measure both the thrust and non-thrust cylinderdiameter at 100-mm (3.938-in) below the decksurface-(2). Record your measurements.Calculate the difference between the2-measurements. The result will indicateout-of-round at the lower end of thecylinder.Compare your results with theEngine Mechanical Specifications. 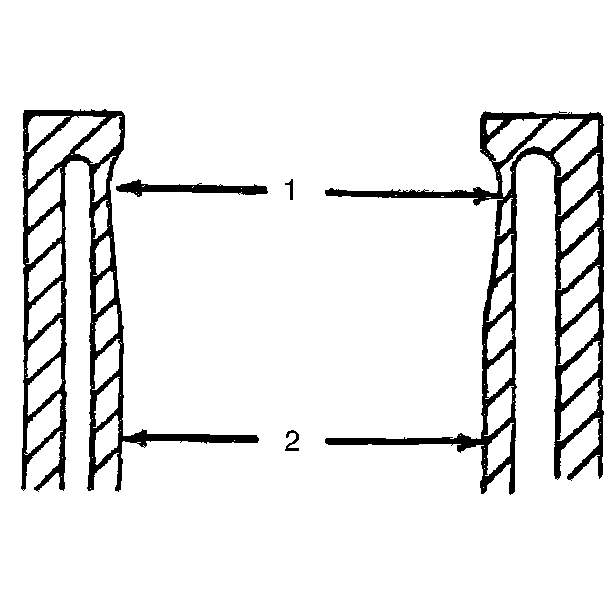 If the cylinders exceedthese specifications, the cylinder block may be oversized to0.25-mm (0.010-in). There is only one size ofoversized pistons and rings available for service. Refer toCylinder Boring and Honing.